Our Club Name - "The Victorias"
The St. Vital Victorias were named in the memory of Company Sergeant-Major John Robert Osborn, V. C. Originally from Norfolk, England, Osborn settled in St. Vital and served with the 1st Battalion of the Winnipeg Grenadiers in World War II. On September 19th, 1941, during an attack against the Japanese at Jardines Lookout and Mount Butler, Hong Kong, the enemy began to throw grenades. Osborn displayed the highest quality of heroism and sacrifice. After picking up several live grenades and hurling them back at the enemy, he threw himself on a grenade in order to save the lives of his comrades. 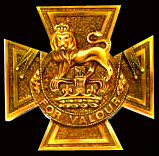 Osborn was posthumously awarded the Victoria Cross, the British Empire's highest military decoration for bravery and gallantry. Set on a black hockey puck background, the white St. V. is joined with the red V for "Victorias". The positioning of the V's symbolizes the unity of the Junior Hockey team with affiliated Community Clubs, the AA Vic teams, and the community in general. The white colour of the "St. V" symbolizes the purity associated with the name SAINT. The red "V" is in recognition of the courage of the man whose confirmed honour promoted the name of the team. The flow action motion of the stylized letters is indicative the spirit of the game of hockey, and, specifically, of the Junior Victoria hockey club. The St. Vital Minor Hockey Association was created in 1972 to administer minor hockey in the area. Three years later, the Major Junior Victorias were formed, as the club joined the Manitoba Major Junior Hockey League (MMJHL) for the team's inaugural campaign in 1975-76. The 2011-12 season will mark the 37th season of the Junior Victorias as a member of the current ten-team MMJHL. The Juniors adhere to the regulations of Hockey Manitoba, operating as a community-owned club. St. Vital is located in the south-eastern area of Winnipeg, with a population of approximately 61,605 people (2006 census). The Association is comprised of the Dakota, Glenlee, Glenwood, Greendell, Norberry, and Windsor Community Centres. Our Program - "The Major Junior Victorias"! Our mission is to provide the opportunity for young men, aged 17-21, to play exciting, fast-paced, junior hockey at a highly competitive level, working in conjunction with their educational and work-related needs. The focus of our program is to provide competitive excellence, team cohesiveness, personal growth, and community pride. We respect our players' educational and work-related priorities; our program is carefully structured to avoid conflicts with these commitments. We respect and appreciate that the overwhelming majority of our players are either full-time students at local universities/colleges, or are working on a full-time basis. Our team is comprised of 23 players from the Junior A, AAA, AA, and High School levels. We recruit from the St. Vital area and "open areas", as defined by our league constitution. Each year, Training Camp opens around Labour Day, with the season beginning in late September. We play a balanced, 45-game schedule that consists of 2 games and 1-2 practices per week. Our games are generally scheduled on Thursday and Sunday evenings. Rarely do the Victorias play on Friday or Saturday evenings. All games are played within the City of Winnipeg boundaries, and surrounding areas. Our home rink is the St. Vital Centennial Arena, located at 580 St. Anne's Road.